Description: Climbing vine like up to 10 or 12 feet trailing along the ground. 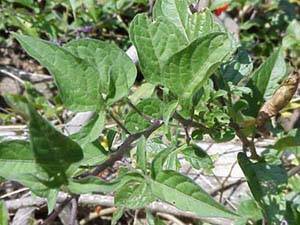 Leaves are ovate and usually with 2 small lobes at the base. 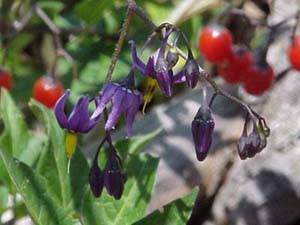 Flowers have 5 petals that swept back, violet in color, the protruding yellow beak (looks like a bannana) formed by the anthers. 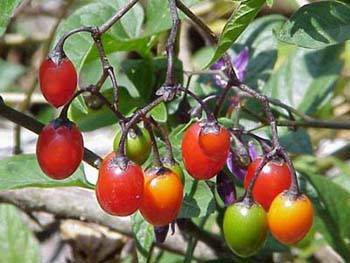 Fruit drooping clusters of egg shaped berries that are green then turn to a ruby red. 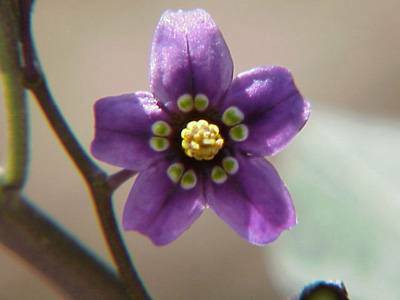 The plant has a disagreeable odor and is poisonous if eaten. The irish potato and eggplant are members of this group.